All Hardin MD (HMD) pages have tags at the bottom, to make them more visible for search engines i.e. Google. We have been doing tagging in HMD since 2000, and it works very well. 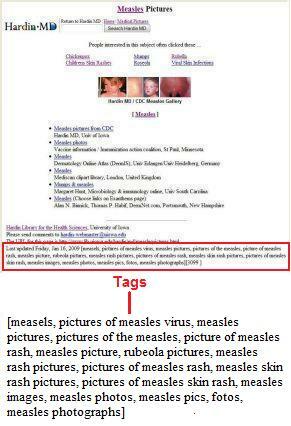 As shown in the example to the left, the tags are for variant spellings (measels), variant terms (rubeola), and words and word combinations relating to pictures (we have found that the word “pictures” is especially favored by Google). One of the things that has made HMD fun has been applying longstanding practices of librarianship to a web-based system. Having been a cataloger for a brief time early in my library career, it seemed natural to put tags at the bottom of the web page, just like subject headings are at the bottom of cards in the card catalog. Including mis-spellings in the tags to help users find the page seemed natural, too — As a cataloger, I had been taught to put x-ref cards in the catalog for variant ways that patrons might look for a book, and following the same principle on web pages, it became possible to apply it on a much larger scale. It continues to surprise me that this simple idea — Putting tags on web pages — has not been more widely applied. I have seen very few cases of it at other sites. I suspect part of the reason for this is that people have tended to think the hidden meta keyword field was the place to put tags, rather than “cluttering up” their pages by putting them on the page. Google’s announcement a few days ago that they ignore meta keywords finally puts an end to that idea. But many SEO people have thought meta keywords were ineffective for a long time, and it was certainly our experience — Around the time we began putting tags on pages in 2000, we compared meta field tagging and on-page tagging, and found that meta field tagging seemed to be ignored by Google. I suspect a reason that people don’t think more of experimenting with tagging and Google visibility is that it is a lengthy process. Google’s not going to see new words on your page right away. It may take several weeks or even months. So it requires careful record-keeping, to note when words are added, and having a regular schedule of Google checking to see if your pages are starting to appear in search results. Posted in Google, Hardin MD, Library Catalog, Metadata, PicsYes, SEO, Uncategorized. Oh dear. The basic problem that you’ve got with this idea is that you’re making your keywords an exclusive entity on the page. If a keyword is appropriate, why isn’t it *already* in the text on the page? If it’s not already on the page, what’s the point in adding something like this? Second point: if the only place you’ve got your keyword is in your collection of terms at the bottom and Google shows this in the SERPS it’s not informative or helpful for the end user; it just looks like a desperate attempt (which it is) to rank more highly. Third point: keyword density. If you’ve only used your keyword once (which if you’re writing content organically) Google isn’t exactly going to consider this to be of any real value at all, so it’s unlikely to rate the page highly. You’re quite right that this ‘technique’ hasn’t been used more widely, but it’s not for the reason you think. Interesting post. You may want to consider linking those tags to a tag aggregation page using the rel-tag microformat. You could either implement your own tag aggregation feature (probably best for your content) or link to an existing tag aggregator like Technorati (easier to implement). Phil, How about mis-spellings? They certainly don’t belong on the body of the page — There are two common mis-spellings for “symptoms” — “symtoms” and “symptons” — We get many hits for each. I think Phil has come on a bit strong there. If you have the time and inclination to experiment with anything on a web page to better your rankings then I say go for it. You certainly can’t harm your rankings by testing. At the end of the day though, Google is a strange beast and it’s staff go to extreme lengths to stop us figuring them out. I’ve used miss-spellings on a few of my sites, you’d be surprised by the amount of traffic it can bring. I also own a few miss-spelled domains, again, they bring in quite a lot of traffic, which i then redirect to my properly spelled domain. Its a good technique to employ, assuming enough people are actually misspelling that specific word!. This is an interesting discussion about tags. If you use a wordpress blog in the area where you put your posts There is a place to add tags, as you put the content in it will automatically put in the tags and then you can remove the ones that aren’t relevant and you can manually add others. I think Google does still use tags for Images. I also understand that the other search engines still use tags. It is true Google is the 900 pound gorilla in the room and lets say sets the tone, But the other search engines add up too. Anyone know if Tags work well with Video on you tube? Tagging is common today on all social networks and even on small company websites. One reason why not every site is using them, as with tagging you increase your keyword density and maybe overdo which would result in penalizing from google & co. Though its a good idea, as if your post, article, site is low on keyword density, you can simply increase it by that. Tags are even becoming more worthy as soon as you link them, preferably into your own site. ( Deep linking ) – same here, don’t overdo, or add at least a nofollow ( yes, google gives juice to nofollow links too, not that much but does ). Yes, youTube tags will get you definitely more attention, as youTube is permanently and realtime monitored by google. Misspellings are a real conundrum. Using my keyword research tools, I see misspelled wordsphrases that have great search volume and low competition. I hate to present myself as someone who cannot spell-or is not wise enough to use spell check; but misspelled keywords in certain markets appear to be effective. I will dun tri mi sum of thet! It’s kind of odd, Matt Cutts from Google just posted (on his blog) that he doesn’t use tags for his blog. He only uses categories. However, I know for sure that my tags do get picked up in the serps. I actually decided to do my own research on the difference between tags and categories when it comes to blogs. Now, I run all my blogs on a WordPress CMS (content management system). To test out the indexing preference toward cats or tags, I simply started a few blogs and made some fresh posts. For one blog I used tags and the other I used categories, then I started another and used both tags and cats on every post. The categories indexed quicker and with more preference than the tags! Good article. If you construct your site with aCMS like drupal then tags are pretty much standard for every item you write. Tags are also clickable to find other articles with that tag in them. Nothing wrong with optimizing your page for SERPs! I think adding tags is a long way from being considered “black hat”. It’s possible that using tags may increase website traffic by giving a bit more on page clues to the SE’s as to what the page may be about. But, 1) it may look spammy as some have pointed out, and 2) Google is, as usual somewhat vague I think on whether or not placing mis-spellings of your keywords on the page is, in fact, spam. While it’s tempting to try to replicate what goes on in the offline world online, such as with your card catalog example, the Web is a different animal. If I were to create a poem, for example, with 100 lines that repeated the phrase “do this for more web traffic” it might be my version of art, but Google’s idea of spam.